I went to my favorite egg wrangler, today, and again, the honor box was empty. So, after my drive all the way out to a country road 12 miles form my home, in the rain and cold, resulted in disappointment. Again, I missed out. Why? Because this farmer lets his hens have natural light. Chickens do not lay year-round, without artificial light. Eggs are not really seasonal. His girls on on a darkness induced laying break. Production is cut by 80%, at least. I will need to wait until the days, again, become longer before they will be plentiful again. From hatch to egg laying is roughly six months, unless that six-month period happens when the days are getting shorter (mid- to late fall). In that case, without artificial light, the chicken will delay laying until the days begin to lengthen (late January to late March. It is later in the northern latitudes than those farther south). Chickens produce the most eggs in the first few months of laying and more in warm weather and on sunny days. Some poultry, such as geese and turkeys, lay eggs only in the spring. Chickens lay more eggs in the spring than in the hot weather of summer. When the daylight hours and temperatures drop (late autumn, early winter), egg production declines. The energy is diverted to keeping the chickens warm and to molting (when they lose some feathers and increase new feather production for winter insulation). Sunlight is the key in stimulating egg-laying hormones and in triggering molt. When the days are at the shortest, the chickens cease laying, completely. When the days, again, begin to lengthen (early January) then they, again, begin to lay. By the time the day and night are equal lengths (daylight neutral) the egg production will be in full swing. A broody bird is one that is predisposed to sit on eggs, not all are so inclined. 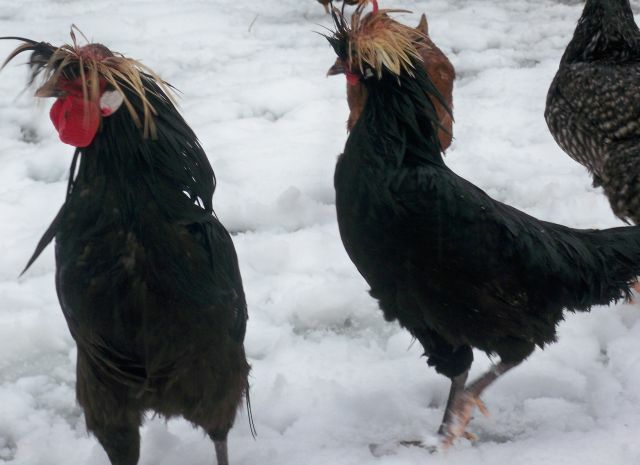 Some chicken breeds are more likely to become broody, some breeds rarely do so. Even with a breed that is said to be a broody breed, only a few individual hens will decide to become broody. However, a broody hen can stimulate other hens to also become broody. Chickens left to molt naturally (with natural light) stop laying eggs for several weeks in the winter. Older birds have a longer resting period than younger ones. As the days start to lengthen, the chickens ramp up the production of eggs.